Call 800-551-5731 or 970-435-5716 to reserve! Non Riding Rates: Rates will be discounted 10% for guests who do not ride during their stay. Deposit: A deposit of 30% is required within 10 days of making a reservation. For groups of 12 or more a 50% deposit is required. The balance is due at the end of your stay with us. Cancellations: Cancellations 60 days prior to arrival will be refunded. Cancellations made after that time are subject to forfeiture of the deposit. Deposits for groups of 12 or more people are not refundable. We recommend trip insurance to protect your deposit. Payment: We prefer your personal check but we also accept Visa, MasterCard, Discover, American Express, and traveler’s checks. Check In / Check Out: Check in is at 3:00 p.m. Check out is at 9:00 a.m.
Horseback Riding: Riding is available Monday through Saturday. Sunday is a day of rest for the horses. Riders who weigh over 230 pounds need to call ahead to discuss their riding options. Accommodations: Our typical occupancy is 25 guests. All lodge rooms and cabins have private baths and daily maid service. The lodge accommodates handicapped guests. Dining: All meals are included. A variety of items can be ordered for breakfast. Lunch and dinner are served in traditional western family-style. Vegetarian alternatives are served at each meal. Other special dietary needs can be accommodated with advance notice. Alcohol: You are welcome to bring your own. Many guests enjoy a cocktail with appetizers or dinner. Children: Our children's program is available June 17 to August 19. Pony rides are available for cowboys and cowgirls ages four through six. Children seven and older can head out on the trail with their family or with their new ranch friends. Read more about our program on our web site or call us for details. Late Season & Adults Only: Our full riding program continues unchanged. Our activity schedule is reduced - our children's program is discontinued as is our naturalist program. Unguided hikes are, of course, still available. Rodeos: Join us during Cheyenne’s Frontier Days (July 19-28, 2019) or Laramie’s Jubilee Days (July 6-14, 2019) and see some real Wild West rodeo action! 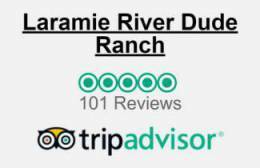 Transportation: If you do travel to Laramie by plane or van, we provide transportation to the ranch at no charge. Ranch transportation starts at 4:00am with an early trip to meet departing flights and ends at 7:00pm. Transport outside these hours is not available. Pets: Sorry, but no pets are allowed. Smoking: Smoking is not allowed inside the lodge, cabins, barns or on trail rides. All or part of this operation is conducted on public lands under special permit from the U.S. Bureau of Land Management. We are an equal opportunity provider authorized by special use permit on Roosevelt National Forest.